Mourinho was also asked about Liverpool defender Dejan Lovren's accusation that United striker Romelu Lukaku deliberately kicked him in the face during Saturday's 0-0 draw at Anfield. "My honest view was he did it on purpose," Lovren said on Monday. The Football Association has not taken action over the incident. Mourinho, however, said: "There is a big contradiction. "He said let's move on and forget what happened but then he spends 10 minutes talking about what he thinks happened and didn't happen. "For me, the FA committee is there to make decisions, so I have no comment." Mourinho expressed sympathy for his compatriots affected by wildfires that have raged across Portugal. At least 36 people died after hundreds of fires spread across central and northern areas on Sunday and Monday. 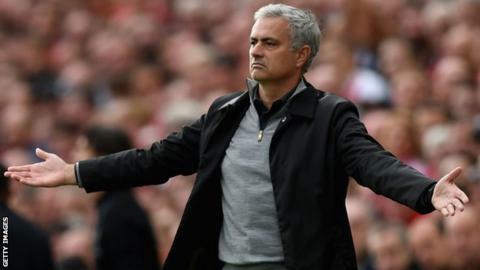 "It's difficult to accept and live with this," former Porto and Benfica manager Mourinho said. "What words can I add to the Portuguese people? "The only thing I could say is that if I could exchange a football match result for the lives of people, and the terrible things that are happening, I would. "Football loses meaning when things like this are happening. "My deepest thoughts are with the people who have lost their lives and I send my strength to the people who are still struggling."